January 8 â€“ January 10. Entrance to the the northern waterway through the swamp. Our information said that you only wanted to traverse this trail at high tide. The swamp was a little shallow at the entrance, but Fever doesn’t need much water to float. The current was very strong, though, and I thought we may have to turn back, but Fever and Greg muscled through it and it got easier as we got further in. The row back, on the other hand, was a breeze. There are only a few bare inches under the keel of our boat. We float in a depthless hole of water. Although the wind has picked up, Blue Wing doesnâ€™t swing on her chain or even bob and weave much. It is a little eerie, but amazingly pleasant. Only one other boat joins us here. 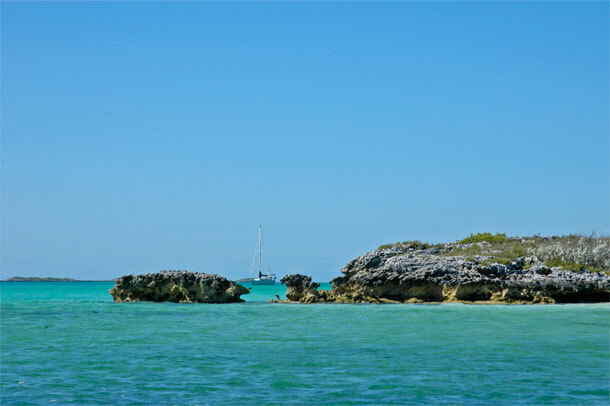 It is not marked as an anchorage on our chart, but this spot is the most agreeable we have moored in since arriving in the Exumas. 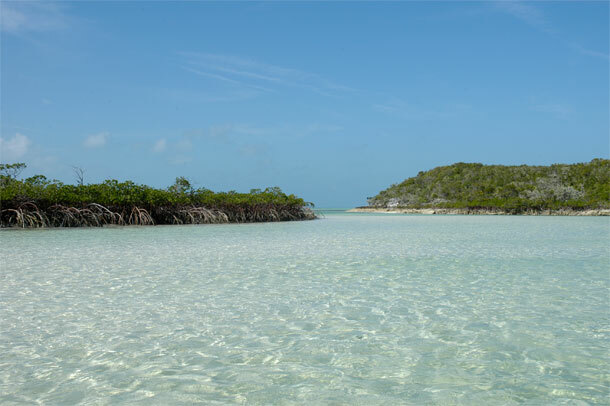 The anchorage was off the coast of Shroud Cay, the first island we visited in the Exumas Land and Sea Park, a preserve of 176 square miles of water, rocks, and islands, rich with history, sea life, and natural beauty. 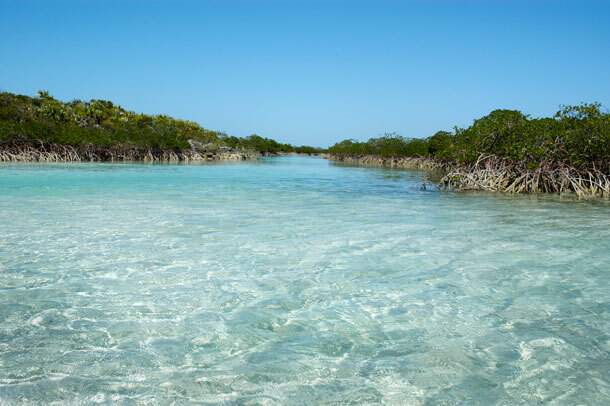 Shroud Cay is a group of cays and rocks surrounding an extensive mangrove swamp, interlaced with water trails. We wanted to be close to the most northern trail to shorten the row to the mouth of the waterway. The small hole of water on the chart looked inviting even though it wasnâ€™t much deeper than our draft and was surrounded by much shallower water. All was well until the second night as the low tide sank even lower than usual on a new moon. We woke from our dreams to creepy feeling of Blue Wing scraping bottom. 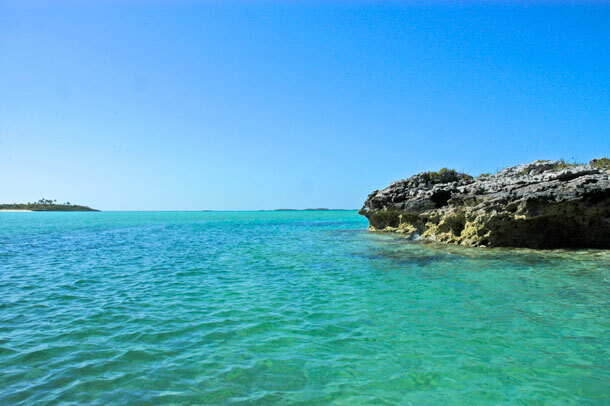 That morning, on a high tide, we motored out of our little oasis to a marked anchorage near the southern end of the cay. Not nearly as comfortable a spot, we rested assured that we wouldnâ€™t awake in the wee hours to find ourselves balancing precariously on the Exuma seabed. 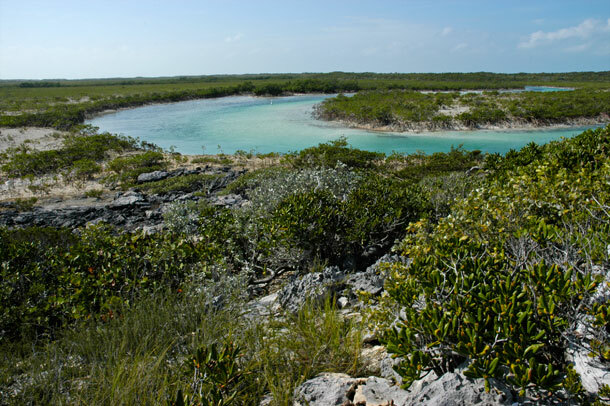 Exploring the trails at Shroud Cay was fun and our dinghy, Fever, was up to the task, rowing through the low waters with only the sound of his oars propelling us along. A bend in the trail. We stopped and climbed this hill to view our progress. The northern trail goes all the way to the sound and we were concerned about how long it would take to get there and how far into the sound we would have to row to get to the beach. Approaching the sound side of Shroud Cay. We stopped at the small beach on the left side of the photo. Luckily we didn’t have row into the strong waters beyond the swamp. I am assuming this is Camp Driftwood. Our 16 year old cruisers’ guide described Camp Driftwood as very special place up on a ridge over looking the sound, that ‘defied description’. Since the guide is 16 years old we understand that it may not always reflect the current status of things. 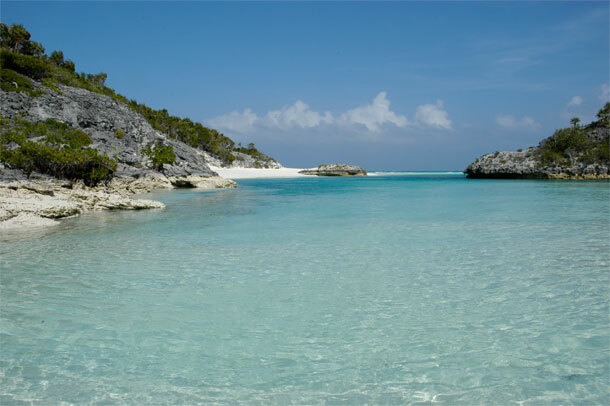 I was encouraged, though, by a pamphlet that we picked up last year at the Exuma Land and Sea Park Headquarters. In a map of the park, Camp Driftwood was noted. 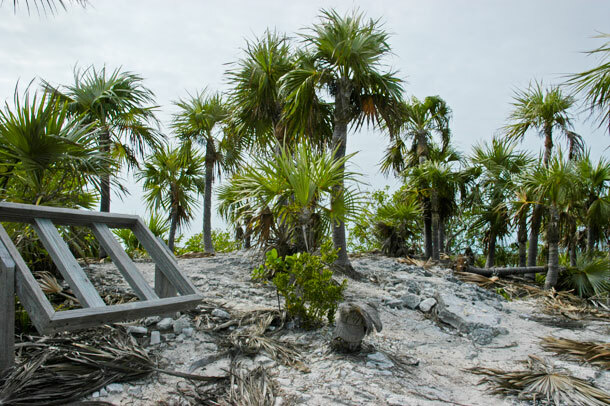 We followed the instructions in our guide book, but this was all we could find and may be all that is left of the “Robinson Crusoe” oasis built by the hermit some time ago. Our cruising guide explained that you must first go to the beach and collect proper tolls before entering Camp Driftwood, so I did. 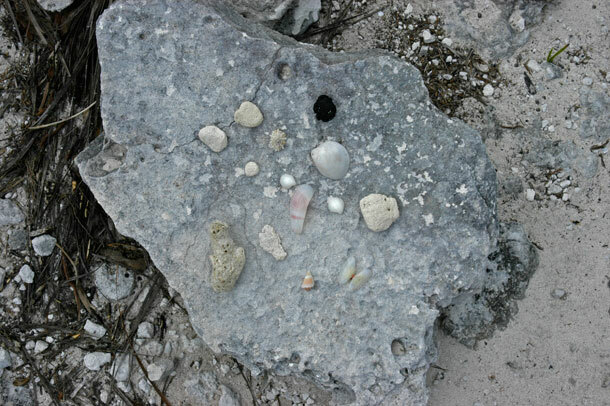 When we got to the spot we found no tolls or treasures. I left mine anyways. Hopefully the tradition will start again. 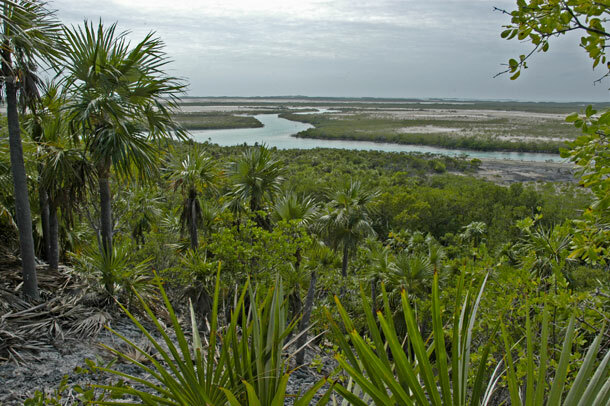 A view of a section of the most northern trail through the mangrove swamp as seen from Camp Driftwood. The path leading from the beach to Camp Driftwood. Blue Wing waits just beyond the entrance of one the southern trails through the swamp. Mangroves line the shores of the shallow water of the swamp. Another entrance to the swamp, looking out. 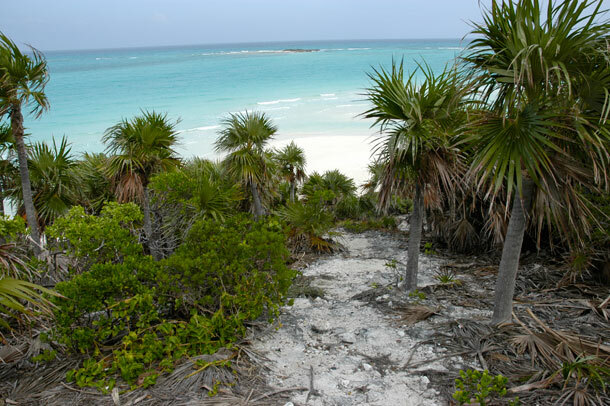 This entry was posted in Life on the Water, The Bahamas, The Exumas and tagged Camp Driftwood, Exuma Cays Land & Sea Park, Island Hike, Shroud Cay, The Bahamas, The Exumas. Bookmark the permalink.